As one of the original Labour modernisers, Peter Reed concludes that 'New' Labour's policies are unrealistic, unworkable and based on no more than ancient dogmas. He shows that alternative policies are perfectly feasible. An international managed regime for air transport could be made to work, starting at European Union level. 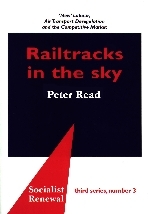 Railtracks in the Sky aims to stimulate constructive debate on these themes. Agree with it or not, this is a highly informative, thought provoking and politically constructive book.